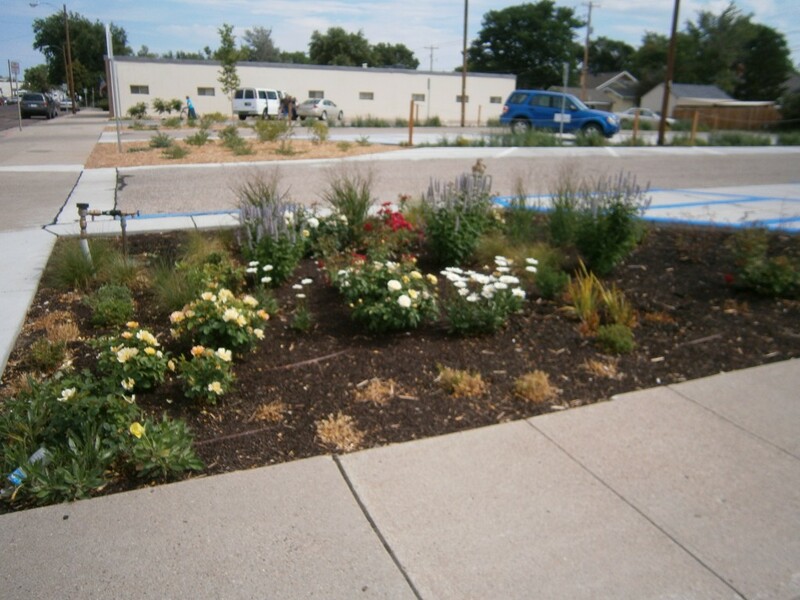 The City of Scottsbluff, working with the Nebraska Forest Service and Nebraska Statewide Arboretum, has recently completed a project that will help reduce stormwater runoff and pollution. 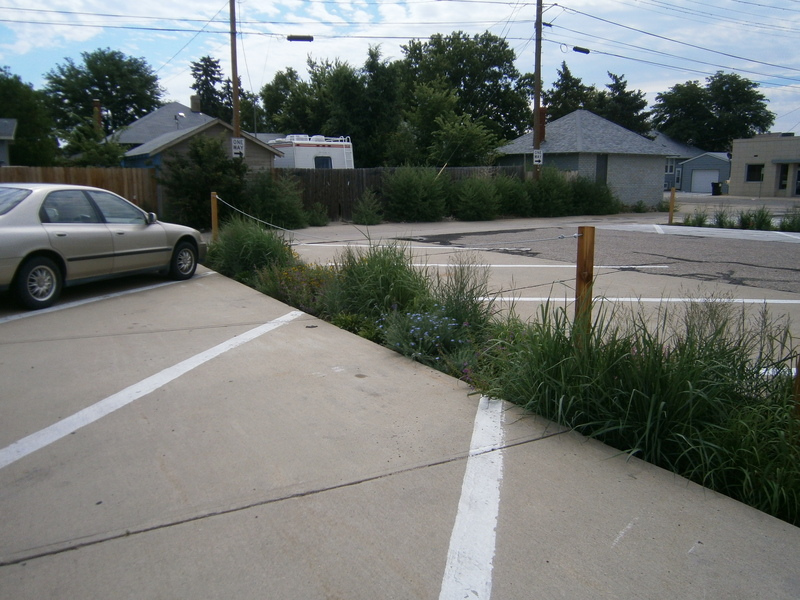 We started with a parking lot that had over 16,000 square feet of impervious surface and no landscaping. 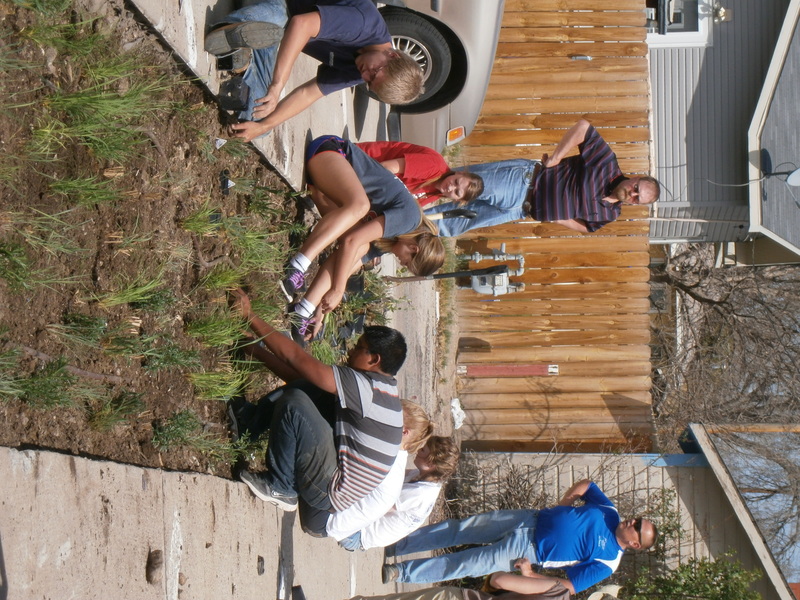 We broke out over 4,000 square feet of concrete and replaced it will trees, shrubs, grasses, and perennials. 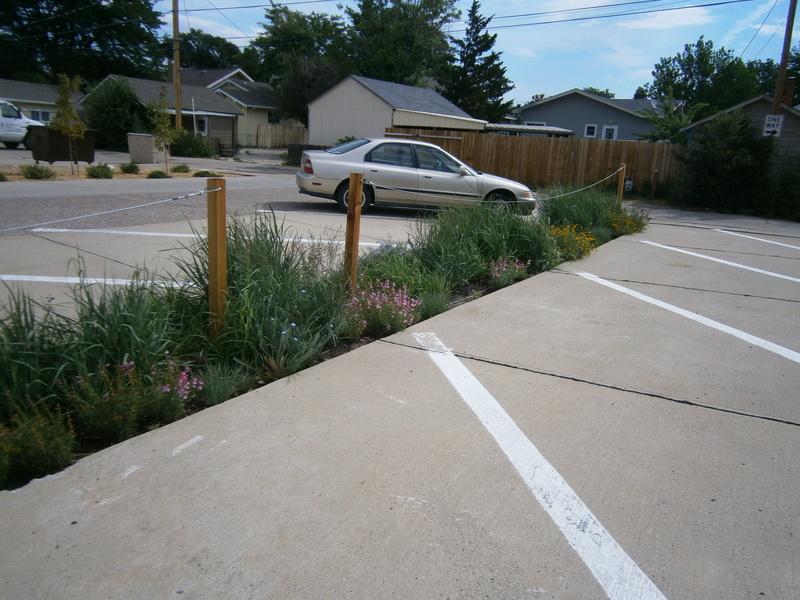 Not only did we reduce the impervious surface area of the parking lot by about 1/4, we also designed the project so that runoff from the impervious areas that were left would run into the landscaped areas, where much of it can be filtered into the soil and utilized by the plants. 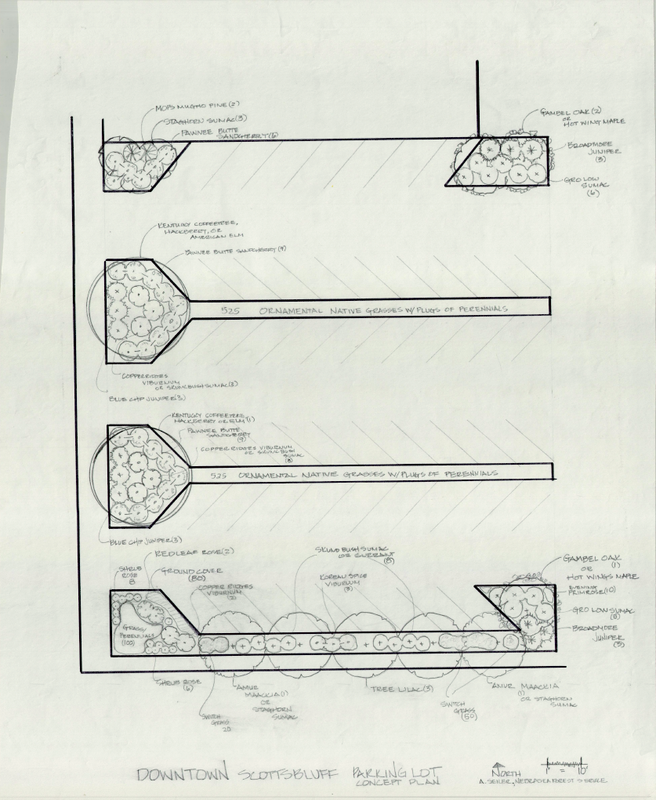 Keep reading for a step by step explanation of what went into this project. 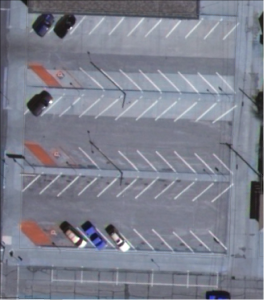 We started with a parking lot that had 57 parking spaces. 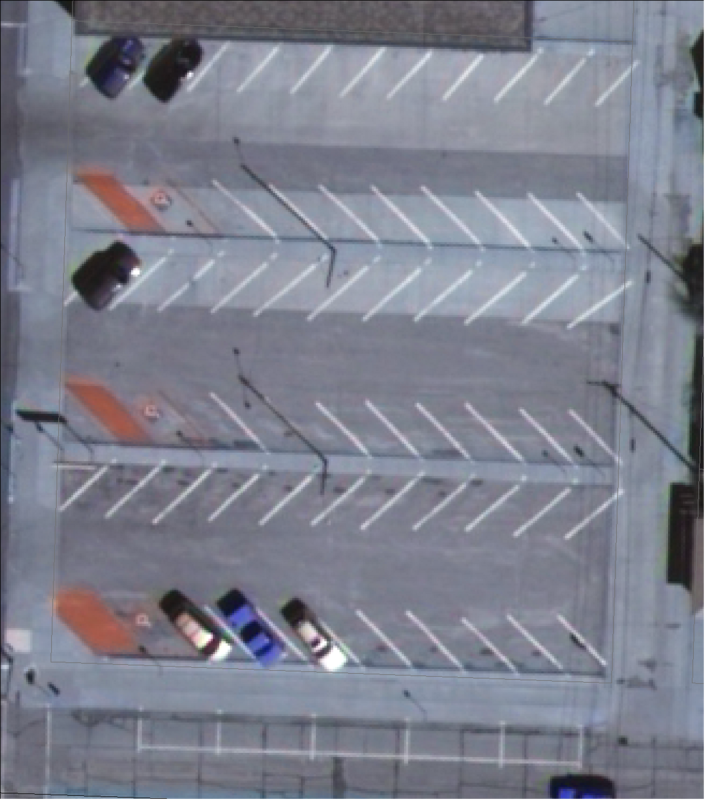 There were raised medians separating rows of parking. 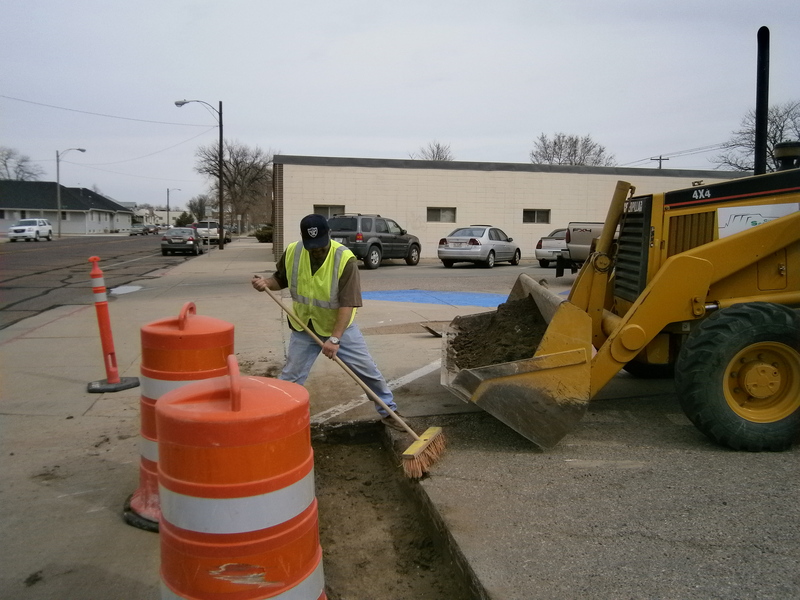 These medians were considered a tripping hazard, and were also difficult to clear snow off of in the winter time. 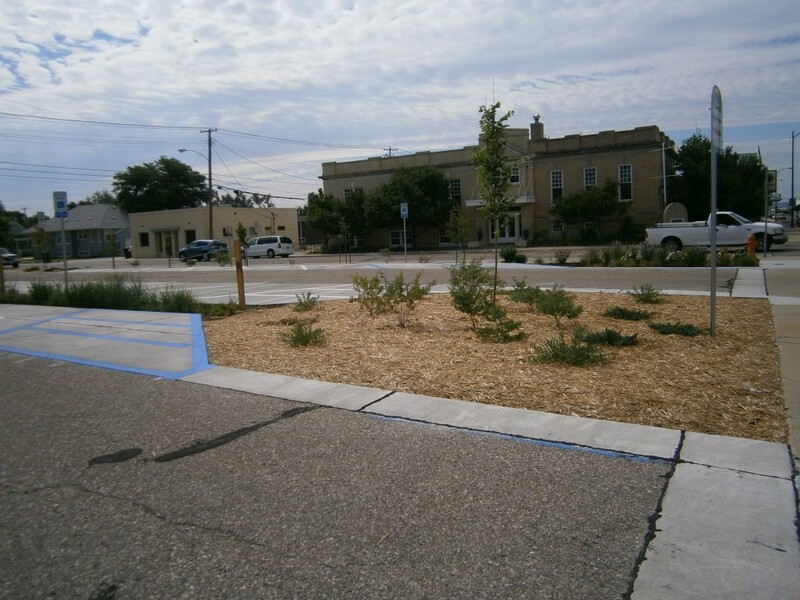 It was decided that the medians should be removed, creating an area for landscaping. 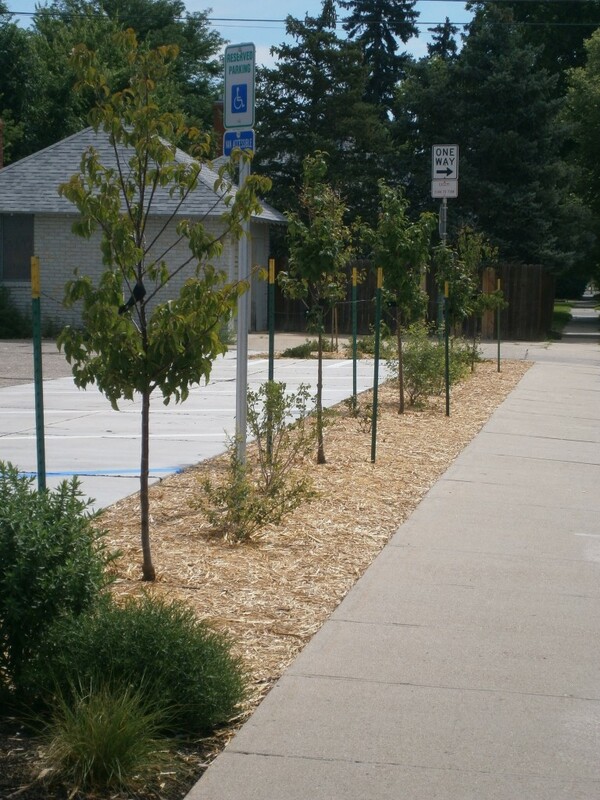 It was also decided that because this parking lot was extremely underused, we could afford to remove a few parking spaces in order to make room for trees and shrubs. 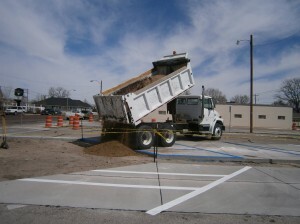 By the time the plan was finished, we had sacrificed 13 parking spaces for this project. 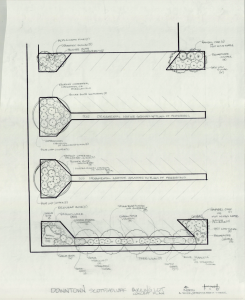 The landscape plan shown below was drawn up by Amy Seiler, Community Forester with the Nebraska Forest Service. 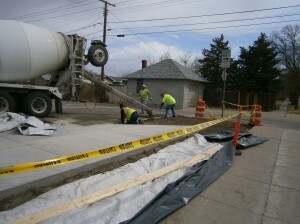 Once we had our plan, the first step was to remove concrete. Unfortunately, because certain areas of the parking lot were in such bad shape, we couldn’t just remove areas of concrete without adjacent areas crumbling. So we had to remove a lot of extra concrete, and pour some of it back in place. 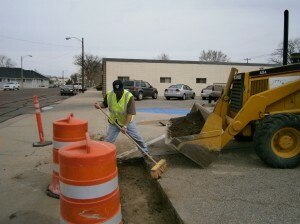 All of this work was done by the City of Scottsbluff Transportation Department. 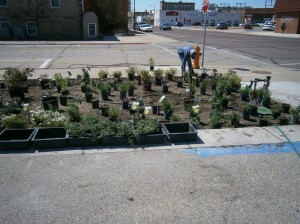 The next step was preparing the area for planting. After the concrete was removed, the areas to be planted were several inches below the level of the surrounding concrete. Topsoil and compost was hauled in by the Wastewater Department to bring these areas up to grade. The next step was the installation of a drip irrigation system. While all the plants chosen for this site are well adapted to drought and use very little water, regular irrigation is necessary for the first year, while everything is still establishing their root systems. After the first year, the irrigation system will be turned off for the grasses and perennials, except during periods of prolonged drought. 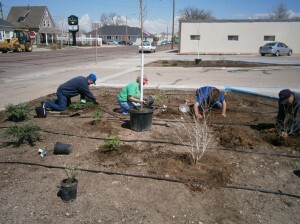 The irrigation will continue to be used for the trees and shrubs. 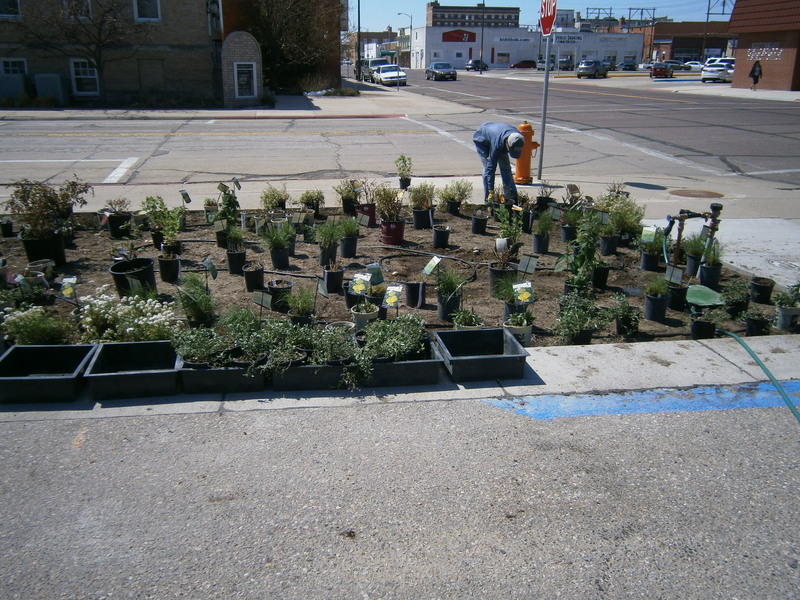 After the soil was prepared and the drip system installed, the project was planted by volunteers and the Water Department. 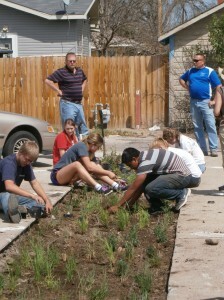 Master Gardeners, members of the Chamber of Commerce Valley Visions Committee, and the Scottsbluff High School landscape design class helped with the planting. 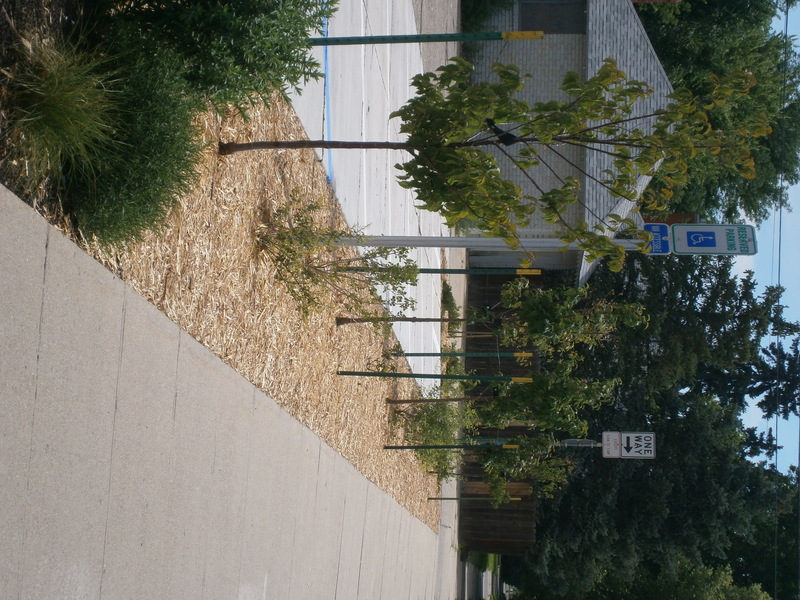 After planting, the entire area was mulched. The use of organic mulch is vital to a healthy landscape. Mulch helps repress weeds, retain soil moisture, and as it breaks down, contributes organic matter and nutrients to the soil. 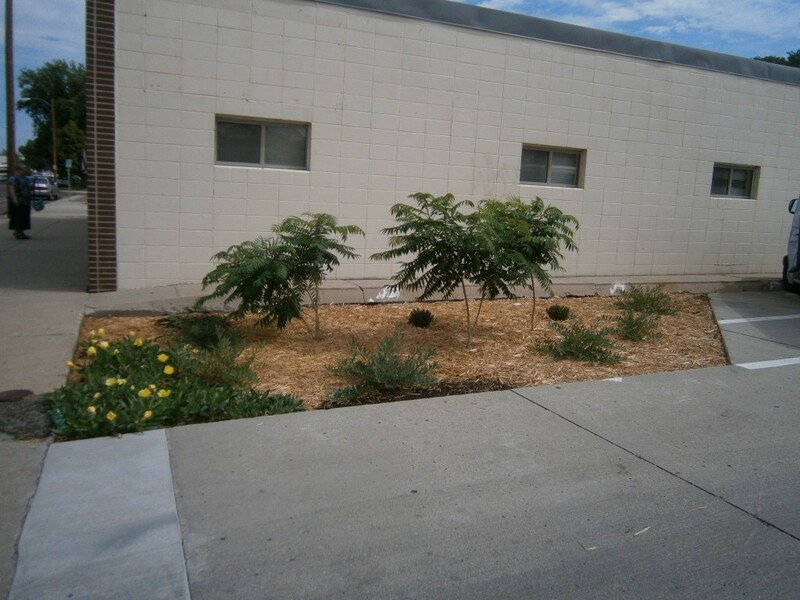 We used shredded wood mulch around the trees and shrubs and cocoa bean hulls around the grasses and perennials. We anticipate large amounts of stormwater runoff in the areas where the grasses and perennials are planted, so we chose the cocoa bean hulls for these areas because they are much lighter than the wood mulch. This way, if some of it does move around and covers a few perennials, they are not as likely to be smothered as if we had used wood mulch. For more information on this and other related projects, contact Annie Folck at (308) 630-8011 or afolck@scottsbluff.org.